Two of Iraq's most influential Shia leaders have signed a deal to try to end violence between their groups. Radical cleric Moqtada Sadr and Abdul Aziz al-Hakim, head of the Supreme Islamic Council of Iraq, have been locked in a bitter dispute for months. The leaders have agreed to try to end further bloodshed, foster a spirit of goodwill and form joint committees throughout the country. A number of recent attacks in southern Iraq have been blamed on Shia rivalry. In a statement, the two leaders said their aim was to maintain both the Islamic and the national interest. "The agreement is essentially a commitment of honour," a spokesman for Sadr's group Liwa Sumaysim told Agence France-Presse news agency. "The most important aspect is that it forbids both sides to engage in bloodletting against each other and against Iraqis in general." A spokesman for Mr Hakim's group, Hamid al-Saadi, said: "Iraq needs deals between factions to enhance and preserve Iraqi unity." The two leaders also say their groups will co-ordinate their media and cultural efforts. The BBC's Jon Brain in Baghdad says, if successfully implemented, the agreement will resolve one of the many disputes that make it so difficult for Iraq to achieve reconciliation. Mr Hakim's Supreme Islamic Council of Iraq, formerly the Supreme Council for the Islamic Revolution in Iraq, is one of the main parties in the ruling coalition. 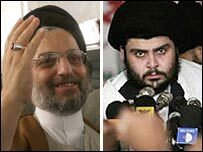 Moqtada Sadr came to prominence after the US-led invasion in 2003 and leads a movement that is backed by his own armed militia, the Mehdi Army. The cleric ordered the suspension of the militia's activities in August. However, he has since boycotted the government and withdrawn his six ministers. Our correspondent says that despite the new mood of rapprochement, Moqtada Sadr has given no indication that his group plans to return to the ruling alliance.